Chage Password option is also included in this site. 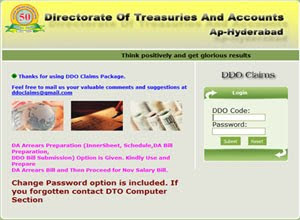 If you forgot the Password contact the District Treasury Ofiicer(DTO) Computer Section. Website Address for Online Pay-Bills " CLICK HERE "
Deductions made Monthwise.No passwords or login required.